This intro geo app and after this update has a problem with my Trackable Inventory. When I select View My Inventory after selecting a geocache, my inventory shows I have 4 travel bugs in my inventory. All 4 TBs are ones that I created, but only 1 of them is actually in my inventory. I released the other 3 several months ago. The paid geo app does not have the 3 in my inventory and the same for the Web site. The intro geo app is the only one that shows them in my inventory. 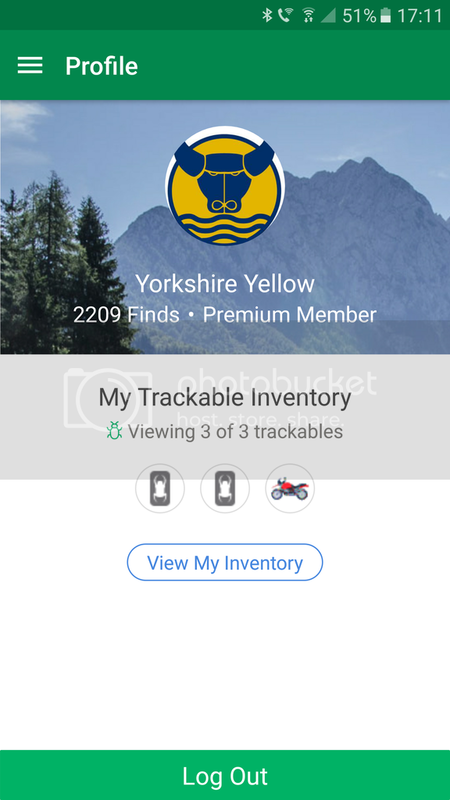 In the free Geocaching App, the TB "GEOBEAR" is incorrectly displayed in my "Trackable Inventory". I dropped it last month, it was since retrieved and dropped, and nowhere else is it shown in my "Inventory". Yeah, the paid App is not doing this. Maybe this App has a different definition of Inventory than the site does. But now it will be more difficult to explain how to know which Trackables are in one's Inventory. That and there still exists the unacceptable text that tells people who find a TB marked Collectible, to "hang onto it", which GS cannot see fit to fix. That and there still exists the unacceptable text that tells people who find a TB marked Collectible, to "hang onto it", which GS cannot see fit to fix. Sure, but did they actually need to put that in the App Designed For New Cachers? They can't just say "Don't Keep It", and simply hope they don't go bankrupt from the flood of Trackables that would be returned to caches? When they include suggestions about keeping the items, that makes a rock-solid case for conflict of interest. Incorrect TB inventory has been reported by multiple cachers across the various threads about the 'new' free app. I don't have screenshots of the paid app, since I didn't buy it, but I did describe my TB inventory mismatches in this post. I can include screenshots that show how the inventory of the free app is incorrect. In the image below, you can see that a TB is listed in my inventory, even though the TB's page shows that it's actually in a cache. This same type of error applies to 3 of the 5 TB's that show in my inventory. On the website there's only one TB in my inventory. On the app it's showing three. I've sorted it, by doing the same as the poster I'd quoted on the release notes thread. I took a screenshot yesterday, but the list is full of tracking numbers (now pixellated in the posted image below) and I have no suitable image editor on my droid. In this screenshot from this evening, GEOBEAR was dropped last month, Dragonride was dropped today. Both are incorrectly shown in my "Inventory", in the "Geocaching" App (Free App, formerly Intro App). GEOBEAR was dropped before the update was installed. Dragonride was dropped after the update. The "Update" left one original icon showing "Intro" on the main screen, and one new icon (in the Apps area) showing the new "Geocaching" icon, and each would open Geocaching version 3.8.2. Since there was an icon discrepancy, I just now uninstalled/reinstalled the App. This fixed the Inventory list at this time, also the App icon. GEOBEAR and Dragonride are not shown anymore. Maybe refreshing the list in any way (not necessarily a reinstall) will also fix the list. But I don't see a Refresh button in the free App. It looks like the App was accumulating TBs that at one time were in my Inventory even though they were not currently in my Inventory. I have just now done the reinstall, so I can't tell what will happen to the list, with the future TBs that I drop. But I'm guessing it's OK now. The paid App doesn't have this issue, and it lists Trackables in a different order than the free App does, sorted alpha-numerically. The free App sorts by I don't know what. With the latest update to the latest Geocaching-R app, the Trackables are still out of sync. The app says that I have 7 trackables in my Inventory, even though I've already dropped many of them. The website correctly shows that I have 2 trackables in my Inventory. 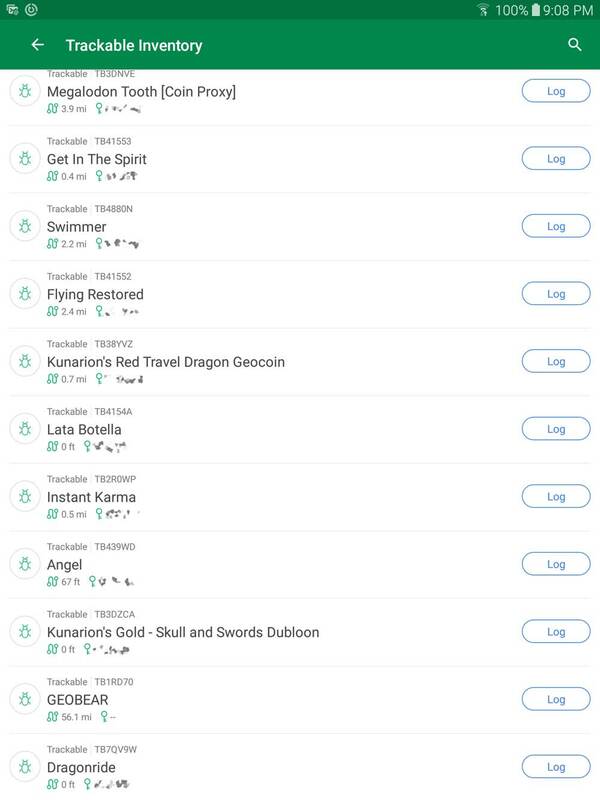 I am still seeing the odd behavior that I noted in this post, wherein I can get Trackables out of my inventory in the app if I open those Trackables and view their activity, then exit out of that Trackable. However, this only works if the TB is in another cacher's possession. If the TB is in a cache, then it persists in my Inventory even after the 'opening/viewing/closing' actions. I am experiencing the same issue even after the update yesterday. The inventory in the app says I have 7 trackables. However 2 of them are ones I released earlier in April and are currently in a cache - not in my inventory. The website shows this correctly. Helping trackables travel around is one of my favorite parts of this game. It is a bummer when they get lost or mis-logged. 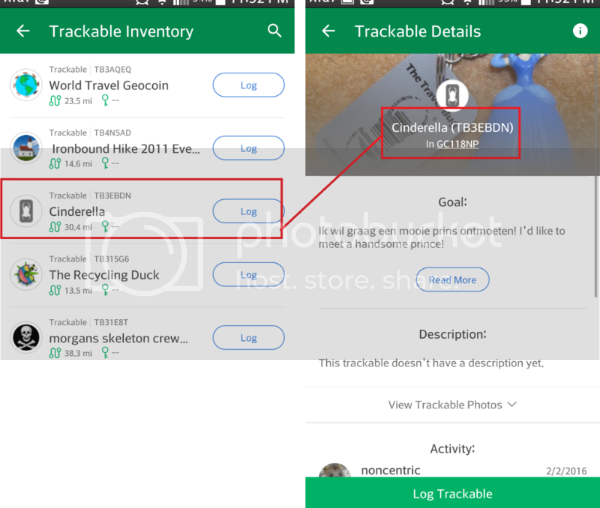 This app needs make the trackable logging process easier, not confusing. An inaccurate inventory list is confusing. We've just put in a fix for this issue, which should hopefully go out with the next release! The update today fixed the trackable inventory problem. Thanks! Inventory is flakey. Mine comes and goes on what it says One time it appears if I have one that I placed back in a cash months ago, then it is gone, then it is back.. This app is useless at best, no favorites, distance goes off the main settings in your input. I use c:geo myself when I use my phone. Well, maybe it was fixed in May, but it's broken again now. I am an old-fashioned geocacher (web page and GPS) but I do have the Geocaching app on my phone. Until today I couldn't find how to get to trackables in the app at all, but after I saw the image above showing the Profile page and didn't know how to get that either--I wonder what would happen if I tap my avatar image. . . well how about that! So anyhow, along with the trackables that I do actually have, there were 4 still showing in my inventory that I had logged as dropped. Opening the trackable and then exiting it did correct the situation, but it shouldn't be necessary to take these extra steps. <...> So anyhow, along with the trackables that I do actually have, there were 4 still showing in my inventory that I had logged as dropped. Opening the trackable and then exiting it did correct the situation, but it shouldn't be necessary to take these extra steps. I think it relies on what's registered on your phone. If you had four TB's in your inventory the last time you used your phone, then when you fire it up next time it'll still show them, regardless of what you've logged on the website. You have to force a 'refresh' of your phone-based inventory. I don't remember how I've done it, but I've done it. Caching the inventory on the phone, if you'll forgive the expression, keeps them from having to continually query the database over the air. Less traffic, faster processing. It's already slow enough. Saves on data, too. If you only cached on your phone and never deviantly used that nasty web thingy, then I think it would always be accurate. Get it? A little narrow-minded development. I've been playing with the Android app lately to explore some of the new features. I'm seeing the same issues with Trackable Inventory that I noted in my earlier post (#10). Today: The website shows that I have no TB's in my inventory - which is correct. The app said I have 7 TB's, so I viewed 1 of those 7 that I've already dropped. When I backed out back to my inventory, the app removed that dropped TB and said I now have 6 TB's. I have click on each TB that shows in my app inventory to see whether it's really in my inventory or not. From the prior posts in this thread, it sounds like the issue was resolved in May, but then resurfaced in August and still persists today. Fortunately, clicking on your inventory item that you no longer have within the app and then backing out removes it from the app's inventory. Confusing. Thanks for the instructions on trackables inventory. Yep. Click on it, back out, click on the next one, back out. Our inventory is now in sync. argh! Or just do the 'refresh' I mentioned above. Doing the 'refresh' you mentioned might work, but how does one "do the refresh"? As you mentioned above (in post #17) "You have to force a 'refresh' of your phone-based inventory. I don't remember how I've done it, but I've done it." If you could tell us how to do the refresh, then that might be helpful. I have opened and closed the app several times, and have even completely restarted my phone at least twice, yet the app still shows that I have 5 TB's in my inventory, when I only have 1. I can click on each TB to force the inventory to sync, but I think it would be helpful to know whether this 'forced syncing' is the intended behavior of trackable inventory in the app, or if there is a plan to fix the app so it shows our actual TB inventory. It's kludgy and cumbersome, but if you display your trackable inventory, then open the display for each one you don't have by tapping on the name, then close it, and it will update the local cache. You'll also notice on that detail display that it will report on where it actually is! If it remains on the list, then GS thinks you still have it. You can display your inventory by displaying any cache, then scrolling down to the 'trackable' section. Even if it says "No TBs In The Cache", there will be a link to view YOUR inventory. Thanks for the answer. I'm still not seeing how it's any different than the process myself, RBFeindr, and PTCDOGWALKERS mentioned in our posts. Clicking on each TB individual to force the inventory to sync with what we see on the website. It is a workaround, but hopefully the app will be updated so that a workaround won't always be necessary. Noncentric - it is the process you guys mentioned. Sorry - I'm reading how many of these things a day? I just missed that. "I say it should be blue!" "Yeah, but what about blue instead? Shouldn't it be blue?"